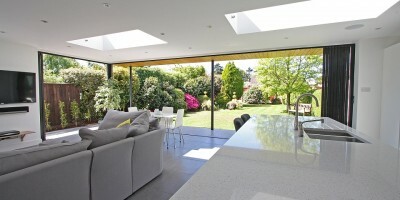 If you have a wide expanse to accommodate glass doors between your house and garden, you have a choice of which patio doors will best suit your lifestyle and requirements. 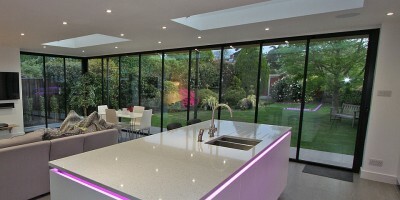 Sightline Doors are very wide sliding glass panels – up to 6m – with ultra slim side frames. If you have an aperture of up to 12 metres (which is extremely unusual for most domestic dwellings) installing one set of a pair of sliding panels will provide amazing viewing with just one narrow ‘interruption’, whether the doors are fully open or fully closed. Access will be approximately half of the available opening but this may still be quite substantial. Alternatively, with UltraSlim Doors, there will be uninterrupted viewing when all doors are open as well as maximum accessibility across almost the whole of the aperture, as all the doors are neatly stacked to the side of the opening. In this case, viewing through closed doors includes seeing the ultraslim frames spaced across. UltraSlim doors can also be delivered with integral blinds for improved control over lightflow, especially from a fierce sun on south-facing doors. The images shown are from an UltraSlim installation. These illustrate the views through UltraSlim, when all are closed and all are completely open. Notice the support pole about halfway across the wide opening – this would be a similar view to that of Sightline large glass leaf sliding door panels, when closed or fully open. We can provide you with a quotation for both styles and our sales team will be happy to discuss your specific requirements to help you make the right decision. Call us on 01582 492 730 or, if more convenient, submit the contact form.